Meet our CTO, Scott Davis, on Monday, August 31st, at 1:30pm, for a talk entitled “Disruptive Storage Innovations and the Impact on Virtual Desktop Solutions.” Scott will discuss the next wave of storage technologies, their architecture and tradeoffs, while tying them to the unique demands of VDI environments. We’re proud to sponsor this year’s #VMunderground, the biggest community-organized event at VMworld. It is on Sunday, August 30 at 7:30pm at the Metreon's City View – and Infinio has 5 VIP passes to give away! Sign up for a chance to win VIP treatment at this fantastic evening of fun. If you are selected as one of the winners, we will announce it on social media and will be in touch with you to give you your VIP ticket. 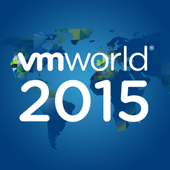 We would love to engage with you while at #VMworld2015. We will be offering a few opportunities for you to win prizes throughout the event! Simply follow @Infinio on Twitter to participate in the activities we post during VMworld and you may be the luck winner of a $250 gift card.